By 1978, Rice's confidence had grown. He had come into contact with a number of extraordinary architects — including Jørn Utzon (1918-2008), Frei Otto (b.1925), Richard Rogers (Richard George Rogers, b.1933, later Baron Rogers of Riverside), Renzo Piano (b.1937) and Jean Prouvé (1901-84) — and had learned a lot from them. He had met the influential designer/inventor Prouvé just before commencement of construction on Centre Georges Pompidou (the Beaubourg), later describing him as "one of the great natural engineers of the middle years of the twentieth century". Rice spoke French and had been living largely in Paris for more than five years. Later, in An Engineer Imagines he wrote that, as he was Irish, he felt more European than British. He liked the food and wine of France and the French way of life. And, perhaps more importantly, he preferred the way the continental construction industry regarded the engineer/architect relationship. Architects liked Peter Rice. He was an extremely good communicator — a good talker and listener, and incredibly charming — and he preferred to discuss the development of designs rather than use drawings. In fact he wasn't very good at drawing, which the architects and engineers around him accepted. In an internal lecture he gave at Ove Arup & Partners in 1990, he indicated that he thought the usual British approach of starting the design process with a sketch defined a design prematurely — and possibly he felt at a disadvantage. The French method of discussing concepts first put architect and engineer on an equal footing. Writing in 2013, Rice's sister Kitty speculated on the nature of his assumed dyslexia. Discussing him together with her husband, she described that, "They relied much more on coming up with solutions from within thier brains than looking up other people's thinking. Peter told me that when he had a problem he used to ... go into his mental junkyard and search there for solutions that he had used in the past or [were] just part of his thought process. He spent a lot of time thinking and could be very quiet." An interesting counterpoint to his communication skills. Although he remained a director at Arups and worked on major projects for them from London, he was given leeway to pursue other working partnerships. After the completion of the Beaubourg project, senior partner Jack Zunz (Sir Gerhard Jacob [Jack] Zunz, b.1923) had realised that Rice was now "his own man". In an interview in 2012, Zunz explained that he made a deal with Rice, that Rice would divide his time 5/8 in favour of Arups. In this way he was able to keep Rice with the practice. The first of these 'other' relationships was with Renzo Piano, with whom he formed the short-lived partnership Piano & Rice Associates (1978-81) — along with Shunji Ushida, Noriaki Okabi, Bernard Plattner, Mike Dowd and Reiner Verbizh, most of whom had worked on the Beaubourg project. Rogers and Piano had dissolved their partnership after Beaubourg, and Rogers had gone to London. Piano wanted to go back to Italy. Piano & Rice Associates set up in Genoa, with a small office in Paris — in an apartment Piano had found earlier. Rice and Piano had developed a close working relationship during the Beaubourg years. They would continue to work together, even after Piano & Rice Associates was dissolved. In fact, Rice, together with Arups' services engineer Tom Barker, would work on almost all Piano's major projects up to 1992. The new partnership concentrated on experimental work, not all of which involved buildings. 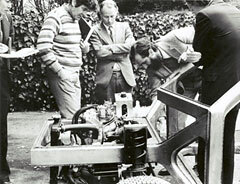 Projects included two experimental vehicles (including the Fiat VSS Experimental Car, 1978-80 [with some input from Arups]), an industrialised construction system (for Vibrocemento, 1978), 10 television programmes ('The Open Site' series, 1979) and a planning strategy for historic urban towns (UNESCO Neighbourhood Workshop, Otranto, 1979). In his writings, Rice would later use the Fiat project as an illustration of the difficulty of effecting change in industrialised societies. 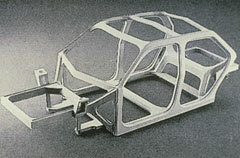 Brought in to explore new thinking in car design, Piano & Rice Associates succeeded in proposing the basis for a new prototype — which was implemented without them — but realised that the continuous development world of the motor industry was very different from the start-from-first-principles world of building design and engineering. Nevertheless, Fiat appreciated their efforts enough to set up a research institute after the first six months, with Piano as chairman and Rice as vice-chairman. It was called IDEA (Institute of Development in Automotive Engineering) and based in a villa in eastern Turin, which Rice loved. The project came to a close after 12 months, when Fiat took the prototype plans in-house. Piano & Rice Associates was based on the idea of trying to "combine architects and engineers in equal partnership", as Rice wrote. However, most of the commissions were predominently architectural, and it proved difficult to align the tax and legal obligations of the UK and Italy. It wasn't working out. In 1981, the partnership dissolved and the Genoa office took the name Renzo Piano Building Workshop. Piano-designed projects that Rice worked on after 1981 include the tensile structures for the renovation of the Schlumberger industrial complex in France (1981-4), the IBM Travelling Pavilion (1982-4, European tour 1984-6, London site), the Menil Collection Museum in Houston (Piano & Fitzgerald, 1981-86), Stadio San Nicola in Bari (1987-90), the European Synchrotron Radiation Facility in Grenoble (1987) and Kansai International Airport terminal building (1988-94). Many of these projects Rice worked on as a director of Arups (IBM, Menil, San Nicola, Kansai). Back in 1975, Arups had set up Arup France, led by Beaubourg team member Lennart Grut (b.1941) and Gerry Clarke, working on projects unrelated to Rice's work. Among the structural engineers working there was Henry Bardsley (b.1950). Bardsley would move to Genoa to join Piano & Rice Associates but would come back to Paris after a year to work again with Arup France. He later joined Rice's next partnership, RFR, which would be set up in Paris in 1982. Between 1978-81, Rice was also working on major projects at Arups. 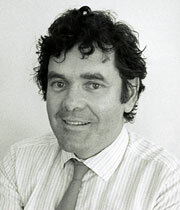 He worked with Richard Rogers & Partners on various aspects of a number of buildings, including the tension roof of the Fleetguard Factory at Quimper (France, 1978), the Patscenter factory project at Princeton (New Jersey, USA, 1978) and, most significantly, Lloyd's of London (London, 1978-85). In 1981, he contributed to the design of the lightweight roof structure for the main terminal at Stansted Airport (constructed 1986-91), designed by Foster Associates. 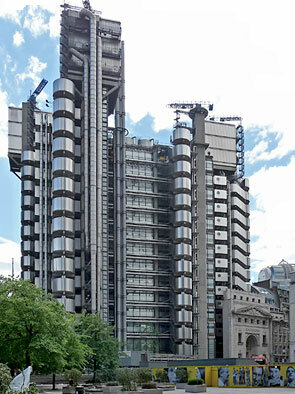 Lloyd's of London was the next big project to follow the completion of the Beaubourg. It would be an exploration of the use and properties of concrete. Where the Beaubourg has an external steel structure, Rogers' Lloyd's building would have an external concrete structure — a choice of material necessitated by fire regulations. Rice accompanied Rogers to present to the client panel, in competition with five other contending teams (most of whom Arups was also supporting). Instead of presenting a scheme, they described an approach — we understand space and the necessary technical disciplines, we know what you are looking for and we have a team that will support you in achieving it. The concept of highly-flexible clear internal spaces plus a very able team, won Rogers the job. Friend and colleague Mike Dowd believed that having Rice at the interview helped cement the win. "My experience is that juries loved Peter", he said in an interview in 2012. Rice was earnest in his desire to understand both architectural and client needs and was extremely knowledgeable and charming. He could come up with straightforward explanations for complicated subjects, and he concentrated on how a design met the brief rather than talking about the beauty of the architecture. Speaking in 2012, Zunz said he was brought in to give the team credibility — Rogers was the antithesis of the conventional formality expected in the City of London. "When you saw Peter and Rogers at a meeting you could see [that wearing] ties didn't come naturally to them." Arups colleague Jane Wernick recalls that Rice acquired his first jacket for the Lloyd's project. Articulating the structure using concrete posed a number of challenges. The building's concrete columns range around the building perimeter and the central rectilinear atrium, supporting a cast in situ concrete floor grid system. Precast bracket assemblies (incoporating bearings) transfer floor loadings to the columns, in a similar fashion to the way the gerberettes work on the Centre Georges Pompidou. Rice saw the Lloyds project as an essay in pushing concrete design to its limits. Rice felt strongly that "... the most powerful way an engineer can contribute to the work of architects is by exploring the nature of materials and using that knowledge to produce a special quality in the way materials are used" (An Engineer Imagines). Shortly after Piano & Rice Associates was dissolved, Piano began work on a building for the Menil Collection Museum in Houston, Texas. This project gave Rice the opportunity to explore the possibilities of two further materials the studio had been experimenting with: ferro-cement (a highly-reinforced thin section of high strength concrete) and ductile iron (a more-flexible form of cast iron). The two are combined in the main roof. A key client requirement was that the galleries be naturally lit, from above. Light should not fall directly on the artworks but the variable light in the 'outside world' should be apparent inside the building. The solution developed consists of three layers — an upper layer of weatherproof glass that reflects heat and ultraviolet light, a middle layer of ductile iron trusses for strength and spanning capability, and a lower layer of smooth white ferro-cement louvres that moderate the light, deflecting it twice as it passes through the structure. 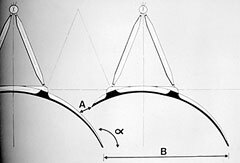 Piano's initial idea had been to use a space frame in which the truss diagonals were ferro-cement louvres. However, Rice thought this arrangement would restrain the potential shape of the louvres too much — they had yet to do the work of analysing local light conditions for the optimum profile. He proposed separating the louvres from the support structure. 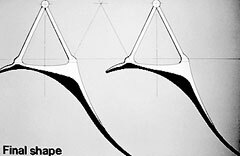 Piano re-designed the louvre shape and this was refined using computer and physical modelling. Rice again: "In combining them we sought to weave together the porcelain-like fragility of the ductile iron with the soft, grainy texture of the ferro-cement into a continuous melded whole". (An Engineer Imagines). He liked the project's design method — deciding on materials, exploring how their properties suited the functions and then improving on standard manufacture to get the high quality required. There were a number of projects where Rice's ideas were pivotal, though he was not involved day-to-day. An example is the terminal roof at Stansted Airport (Foster Associates). Arups' structural team considered lots of options but none seemed right. Norman Foster (Norman Robert Foster, b.1935, later Lord Foster) asked Rice to attend a design review meeting. Rice suggested breaking up the then-flat roof with curved grid shells based on the square grid of service 'trees' already proposed. Bardsley recalled in 2012 that Rice gave the team the confidence to push the structural design further. Speaking in 1992, at the RIBA award ceremony at which Rice was given the Institute's Gold Medal, Rogers said of Rice, "He is so much part of the design team that it is invidious to highlight specific areas where his involvment changed the direction of our thinking". He also said that "... [since the Beaubourg competition] there has hardly been a week when I haven't worked or talked with Peter". Working from Genoa — and with some input from Arups — Piano & Rice Associates worked for 12 months on the Fiat VSS Experimental Car project. ... The illustration shows the pressings for the steel frame assembled. The Piano & Rice team working on the Fiat project. Rice is on the left with his hand in his pocket. 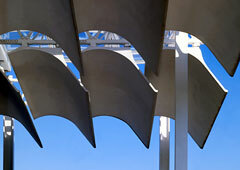 The ductile iron truss-supported ferro-cement louvres of the main roof at the Menil Collection Museum in Houston, Texas. Architect Renzo Piano's original concept for the roof structure for the Menil Collection Museum had the louvres as part of a space frame structure. 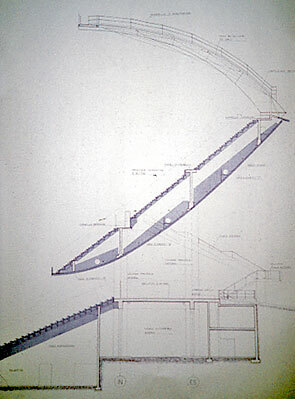 Rice suggested separating the louvres from the structure, making other louvre shapes possible. Piano designed a more interesting form. consideration of factors such as computer analysis, physical modelling, prototyping and manufacturing constraints. 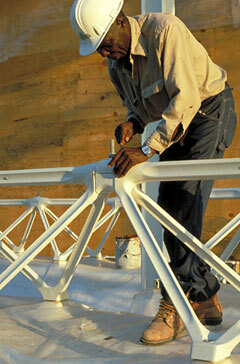 Two forms of truss make up the Menil Collection Museum roof structure. In the first, assembled ductile cast iron components make up louvre trusses, which support rows of louvres. In the photo, the bolted connections are being checked. at each end by girder trusses, also made of cast ductile iron components. The photo shows the trial assembly of the first castings. Lloyd's of London, showing the visual articulation of its concrete structure, more-usually achieved using steel. Features of the building include: open internal space with services and structure pushed to the edges of the envelope, a central atrium criss-crossed with escalators, a cast in situ concrete floor grid, external lifts and external stairs clad in stainless steel. 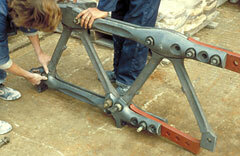 For the support of the Lloyd's of London concrete floor grid, a concrete bracket assembly was developed. 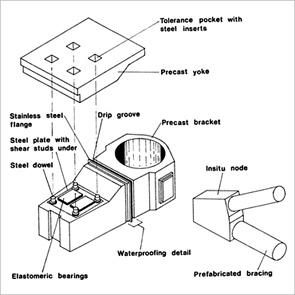 This diagram shows its main elements: a precast yoke, the precast bracket with a ledge and elastometric bearings, and the node end of the prefabricated bracing. The precast bracket was placed on top of the column and concrete poured into the bracket's cylinder to make the connection. Steel is used for specific tasks, such as the internal tubes of the bracing, which provides support for the suspended services installations. Section through Stadio San Nicola in Bari, Italy, which opened in 1990, and is constructed in a combination of precast and in situ concrete.. Two rows of columns support two annular beams, making two continuous portal frames that support the 'clam' structure and encircle the oval stadium. 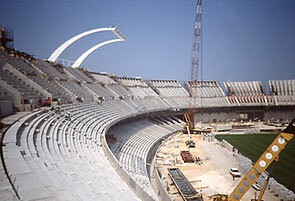 Stadio San Nicola under construction. 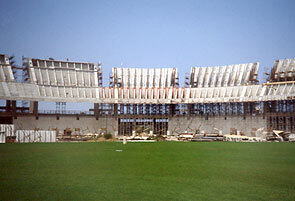 The stadium under construction. The upper tier (and its roof) consists of 26 bays, with stairways between.